The new Liberty launch vehicle, which draws on parts of NASA's cancelled Ares I rocket and Europe's Ariane 5 rocket, will use existing infrastructure at Kennedy Space Center--including, possibly, the mobile launch platform shown in this illustration. NASA's scrapped Ares I rocket may see new life as part of a new private launch vehicle to provide commercial flights to space for satellites, cargo – and maybe even people, the companies proposing it announced today (Feb. 8). The five-segment solid rocket was developed by Alliant Techsystems (ATK), a longtime NASA contractor responsible for the twin solid rocket boosters used to launch space shuttles into low-Earth orbit. But the booster's original purpose – to serve as the first stage for NASA's Ares I rocket for launching astronauts into space on Orion capsules – fell through last year when President Barack Obama cancelled NASA's Constellation program aimed at returning astronauts to the moon. The Ares I rocket served as one of the cornerstones for the Constellation program. Now, ATK has teamed up with the European aerospace company Astrium to repurpose the Ares I rocket's first stage into a completely new, commercial launch vehicle. The companies call the new rocket "Liberty." ATK and Astrium are pitching the Liberty rocket for NASA's Commercial Crew Development-2 competition, which is seeking proposals for commercial spacecraft to transport astronauts to and from space. NASA began soliciting proposals for the program in October and could make funding announcements next month, agency officials have said. ATK and Astrium officials say the Liberty rocket could be ready for a first test flight by 2013 and begin operational launches by 2015 from NASA's Kennedy Space Center in Florida. Astrium builds the Ariane 5 rockets that have served as Europe's primary workhorse for launching satellites and spacecraft into orbit. The company would provide the second stage for the new rocket that is based on the Ariane 5 vehicle, officials said. "Both stages were designed for human-rating since inception and would enable unmatched crew safety," ATK and Astrium officials said in a statement. Once operational, the rocket will be able to launch payloads of up to 44,500 pounds (20,185 kilograms) into the orbit of the International Space Station, which sails about 220 miles (354 kilometers) above Earth. 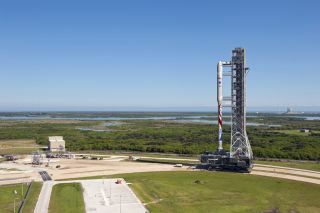 That lift capability should give the Liberty rocket the ability to launch unmanned spacecraft, as well as be scaled up to carry astronauts on crewed vehicles as well, officials said. "The Liberty initiative provides tremendous value because it builds on European Ariane 5 launcher heritage, while allowing NASA to leverage the mature first stage," said former NASA astronaut Charlie Precourt, vice president and general manager of ATK Space Launch Systems, in a statement. NASA's space shuttle program is due to retire this year after three final flights. Once the shuttles retire, NASA is banking on the availability of commercial U.S. spacecraft and rockets to ferry astronauts and cargo to the International Space Station. However, NASA will have to depend on Russian, European and Japanese spacecraft until those American vehicles are available. The Liberty launch vehicle combines the proven systems from NASA's space shuttle fleet and Europe's Ariane 5 expendable rocket. This graphic shows how they combine into the new ATK-Astrium Liberty rocket. ATK's five-segment solid rocket boosters are one segment longer than the versions used to launch NASA space shuttles. The company has test-fired two of the larger rockets at its proving grounds in Utah. In 2009, NASA launched the first Ares I rocket test flight – called Ares I-X – to demonstrate the feasibility of the booster's odd design, which featured a skinny first stage topped by a fatter second stage. NASA hailed the Ares I-X rocket test flight as a success. But in 2010, Obama shifted NASA's focus from the moon to a new target: sending astronauts to visit an asteroid by 2025, and then take aim at a human expedition to Mars in the 2030s. That shift drew criticism from some lawmakers and Constellation program supporters since NASA had already spent about $9 billion on the moon exploration program, which included the Ares I-X test flight and design work on a larger Ares V heavy-lift rocket that also drew on ATK-built solid rocket boosters. A mobile launch platform for the Ares I rocket has already been built, and launch pad modifications for the Kennedy Space Center also drawn up. ATK and Astrium hope to make use of the existing infrastructure to lower launch costs, officials said. "We will provide unmatched payload performance at a fraction of the cost, and we will launch it from the Kennedy Space Center using facilities that have already been built," Precourt said. "This approach allows NASA to utilize the investments that have already been made in our nation's ground infrastructure and propulsion systems for the Space Exploration Program." ATK and Astrium plan to use the United Space Alliance – a longtime NASA contractor used to prepare NASA shuttles for flight – to assemble Liberty rockets for launches. "This team represents the true sense of international partnership in that we looked across borders to find the best for our customers," said Blake Larson, president of ATK's Aerospace Systems Group. "Liberty provides greater performance at less cost than any other comparable launch vehicle."